Court. Online applications are accepted from 05-10-2018 to 23-10-2018. Official website to online form submission for this Assistant Grade 3 posts of Raipur District Court recruitment 2018 is cgvyapam.choice.gov.in. Exam Pattern and Syllabus details pdf is attached with this notification. 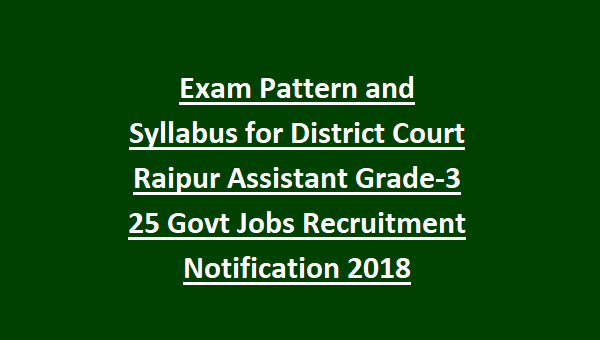 Written Exam will be conducted on 16-12-2018 for this Raipur District Court Assistant Grade 3 jobs. 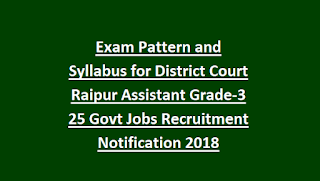 More information about this District Court Raipur Recruitment Exam Pattern and Syllabus, Category wise vacancies, skill test details, qualification are given below. There are total 25 Assistant Grade 3 jobs in this District Raipur Recruitment 2018. As on 01-01-2018 age limits are 18-35 years. For reserved candidates 5 years of upper age relaxation is given. Must have qualified Degree, Hindi Stenography Test and DCA Diploma in computer application certificate is required. Must have Hindi typing knowledge on computer with 5000 key depression per hour. Grade 3 level salary is applicable. Candidates selection will be on basis on Computer Based on test, Stenography Test and Typing test on computer for this Raipur district Court Asst Grade 3 jobs. Written exam will be conducted for 200 marks. Total 200 questions will be given from six various sections. Each question carries one mark. Submit application form online for this Asst Grade 3 jobs of Raipur District. Last date to submit the application form online is 23-10-2018 via the official website of cgvyapam.choice.gov.in. Exam Pattern and syllabus, admit card release date, exam result and other details are available in this website only.